With the Cradle to Cradle certification of our Colortec RE:THINK we have achieved strong visible recognition of our concentrated efforts to run our business sustainably. We have set out on a target-oriented journey towards a sustainable world, with a strong focus on rethinking what we do. We are determined to contribute to the development of environment-friendly solutions in the hospitality industry. Consideration for the environment and social responsibility are nothing new for Dansk Wilton. All production is located in Denmark, so they are natural elements in the way we run our business. We have all activities in house, so we have maximum control over the quality we deliver and the way we affect the world around us. Environmental thinking is fundamental in all production processes, and is part of our good behaviour towards people and the environment. We have reduced our CO2 footprint, and the energy for our production comes from renewable sources (wind energy). We ensure good working conditions for our employees, and take social responsibility in our local area. Our goal-oriented efforts to achieve sustainability are divided into smaller, specific milestones. Thus, we are constantly taking a step in the right direction. Follow our journey here. You are welcome to join us. Our journey towards a sustainable world is target oriented, with a strong focus on rethinking what we do. We make a determined effort to contribute to the development of more environment-friendly solutions in the hospitality industry. We have set ourselves a goal and taken a decisive step towards a more sustainable future. Dansk Wilton’s business strategy is based on the sustainable principles of the Cradle to Cradle approach. As we work for sustainability, we are at the same time on a journey and making steady progress. It is always possible to improve. So that is what we try to do in line with the Cradle to Cradle philosophy. It is not just something we talk about; it is something we act upon. There is a strong demand for environment-friendly products in the hospitality industry both on land and at sea – and Cradle to Cradle CertifiedTM is one of the most renowned product standards in the field. Read more about Cradle to Cradle. With the Cradle to Cradle certification of our Colortec RE:THINK we have achieved strong and visible recognition of our concentrated efforts to run our business sustainably. Read more about Colortec RE:THINK. is produced using pre-dyed yarns in a yarn blend of 80 % wool and 20 % nylon. Colortec RE:THINK is available in a wide range of qualities suitable for all areas – from hotel rooms to high-traffic public areas. As an environmentally certified product, Colortec RE:THINK supports our customers’ focus on environment-friendly solutions. 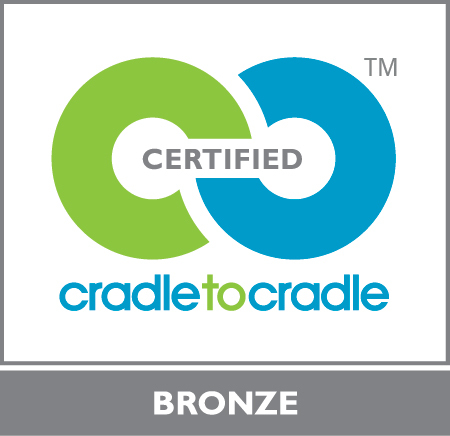 Quite specifically, Cradle to Cradle CertifiedTM products mean extra credits in LEED, BREEAM-NL and DGNB certified buildings. In that way Colortec RE:THINK carpet solutions make a positive contribution to sustainable building. – the most ambitious low-emitting label in whole Europe. Cradle to Cradle is a vision for a world in which consumption and production have a positive impact on the economy, the environment and on people. Where we can benefit our planet without cutting down on consumption and welfare. In a Cradle to Cradle world we design products and structures in society so that all materials are healthy for their surroundings and can be included in a repeated cycle. Waste will no longer exist, and everything will either be reused as it is, or will become a resource for something completely new in healthy biological and technical cycles. The Cradle to Cradle Certified™ Product Standard has been developed on the basis of the Cradle to Cradle concept. The standard is administrated by the independent non-profit organisation, the Cradle to Cradle Products Innovation Institute. Products are assessed by a qualified independent assessment body accredited by the Institute, which verifies the assessment and issues the certificate. To produce carpets from materials that can be included in new, repeated cycles. All substances contained in the product are characterized in detail and assessed, to see whether better alternatives can be found for people and the environment. Based on the ratings, optimization is initiated in collaboration with the supply chain. To design carpets made from components which can be reused, or which only leave an absolute minimum of waste. The long-term goal is 100% recovery and recycling of materials. Reduction of our CO2 footprint and 100% commitment to use energy coming exclusively from renewable energy sources. Water discharged from production is of drinkable quality, and the local water resources are protected. Involvement in how suppliers manage process water. Living up to recognised standards for social responsibility and ensuring fair working conditions in all links of the supply chain. Showing social responsibility and commitment in our local area. With our approach and target-oriented work, and a Cradle to Cradle certification, we have already come a long way. But we are also convinced that there is always something we can do better. We have a plan for that. The point of departure for Cradle to Cradle CertifiedTM is that with a certification we are at the same time committed to making further efforts and raising the bar. So every two years we have to be re-certified on the basis of progress in the individual categories in which we have been evaluated. That means our strategies and goals for the future are an important part of our work towards sustainability and Cradle to Cradle in particular. Our Roadmap defines some overall goals, and we have formulated the strategies behind them. You can see here what we are aiming at. Naturally, a roadmap like this is dynamic, since we are making progress all the time. 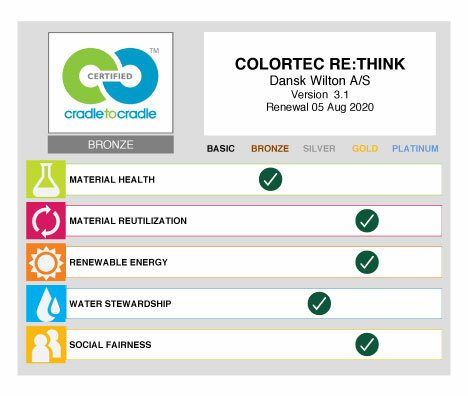 The Roadmap below forms the framework of Dansk Wilton’s focus and commitment within the 5 categories of Cradle to Cradle Certified (TM) over the next 5 years. Our experience and knowledge will grow continuously, so the individual elements will be adjusted in relation to the current knowledge and experience level. Accordingly, the roadmap will be updated continuously. Our overall 100% goal is to contribute to more sustainable development throughout our value chain in close collaboration between all partners. Materials used for the production of Colortec are mapped and suppliers have signed Cradle to Cradle’s “Banned List of Chemicals” and hereby guarantee that they do not use the chemicals listed. VOC A+ rating = Colortec contributes to a healthy indoor climate. Initiate the process of replacing CMR and x-marked ingredients in Colortec RE:THINK. All packing and marketing material (if possible) is Cradle to Cradle certified. All CMR-containing ingredients are phased our/replaced. Other X-rated ingredients are phased out over a period of 2-4 years. All “grey” ingredients are fully defined and assessed. To be defined after re-certification in 2020. 100% environment-friendly components used for Colortec RE:THINK. 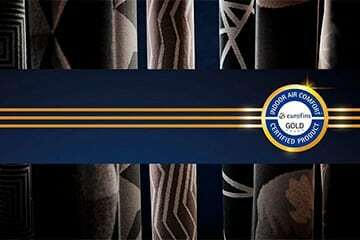 100% environment-friendly components used for our entire carpet production. Nutrient management strategy and objectives for the recycling of Colortec RE:THINK defined. The high content of wool in Colortec RE:THINK carpets contributes to a good score in this category as wool is a rapidly renewable ressource. Identification and classification of existing recycling possibilities and dialogue with potential partners. Pilot projects with selected partners. Continue, further develop and roll out experiences and initiatives achieved in 2018. A take back model to reuse Colortec RE:THINK carpet is in place. 100% recovery and recycling of materials. Design for disassembly, ensuring that materials in their pure componants can be recycled. Apply to our entire carpet production. Dansk Wilton has been an active partner in the “Carbon 2020” project and has reduced its CO2 emissions by 40% over 4 years. >60% renewable energy (WIND) throughout our production processes. All lighting in the production facilities is energy-saving LED technology. Continued focus on reducing our CO2 footprint. All lighting at Dansk Wilton is energy-saving LED technology. 75% renewable energy (WIND) throughout our production processes. 100% renewable energy (WIND) throughout our production processes. 100% renewable energy (WIND) in our supply chain. Dansk Wilton has no wastewater. Secure objectives, strategy and action plan for wastewater used by our primary suppliers. No contaminated waste water in our supply chain. Cradle to Cradle-principles introduced in our organisation and value chain. Detailed road map for this category prepared. Initiate improvements in accordance with B-Corp-Assessment. All subcontractors document that they comply with the United Nations Global Compact and have strategies for possible improvements in all categories. Companies in our supply chain meet the highest standards of social fairness. The next step is to take yet another step in the right direction. Follow our journey here on our website. You are welcome to join us.